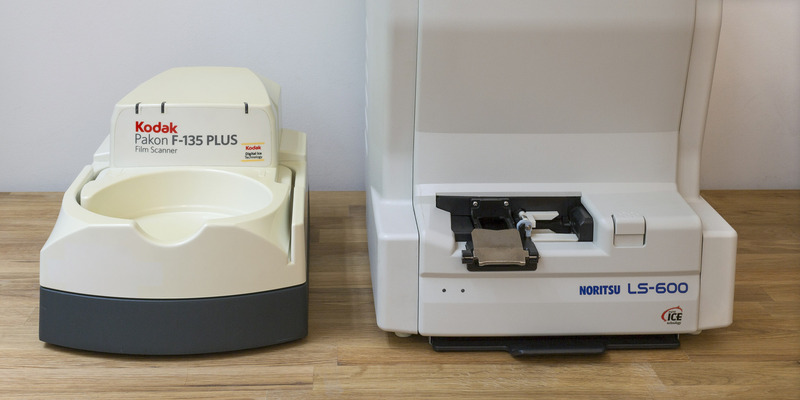 The Noritsu LS-600 and Kodak F135 Plus film scanners were both designed to be used in minilabs. In the early 2000s, they could be found in minilabs across the country. As digital cameras gained popularity, demand for film scanning dropped, and minilabs discontinued scanning services. Major minilabs, such as Walmart and CVS, began decommissioning scanners in 2013. These scanners became available on secondary markets, such as eBay. There, they gained popularity among photography enthusiasts. An active online community formed around using, maintaining, and troubleshooting the scanners. The Kodak scanner, in particular, gained traction. Within a few years, its price on the secondary market increased from $200 to more than $800. This price point brought it into competition with another advanced product in the minilab scanner range: the Noritsu, which was selling for about $950 on the secondary market. Today, these two products dominate the minilab film scanner category. Prospective buyers face an interesting choice: the sleek, popular Kodak or the large, top-of-the line Noritsu? This article will get you started on making the choice by comparing the scanners in terms of price and availability, general specifications, maintenance, software, film compatibility, scan files, and scan speed. A detailed review of the Noritsu scanner and comparison of scan quality is available here on Go Street Photo. Because both scanners created for use small labs, both were produced in small quantities. Starting in 2014, they became readily available on secondary markets, such as eBay. Kodak F135 availability piqued around 2014, when major chains moved out of the film processing market. Today, both scanners can be purchased on secondary markets or from minilab refurbishers, such as AAA Imaging. Due increased demand in recent years, their prices are comparable. The Kodak sells for around $800 and the Noritsu for around $900. The most striking difference between the scanners is the size: the Noritsu is much larger. At 37 pounds, it is also almost four times heavier than the Kodak. For the rest, the scanners are comparable. Both use long-lasting LED light sources and widely available USB 2.0 connections. In terms of maintenance, each scanner has distinct advantages and constraints. The Noritsu is still in production and fully supported by the manufacturer – at a high price. It is easy to clean, but challenging to repair at home due to its complex design. There is also an active community on Facebook. By contrast, the Kodak has been discontinued, and the manufacturer – Pakon – went out of business in 2008. However, an active community on Facebook and other online forums provides support by sharing reviews, repair guides, and FAQs. Parts are also readily available on the secondary market. Easy to dismantle and to repair. Parts (e.g., roller, electronics board, etc.) are available on secondary market. Complex design. Cleaning Dismantling required to access and clean key components. Opening doors provide ready access to key components for cleaning. Since both scanners were intended for minilab operators, their interfaces were not designed to be broadly user-friendly. As a result, there is a learning curve for new users. In general, the features are relatively straightforward – though not pretty, especially by 2016 standards. Both scanners are compatible with a single (obsolete) Windows operating system. Here’s where Noritsu has a significant advantage: it requires Windows 7, whereas the Kodak requires the – much more challenging to find – Windows XP. Some users successfully run the scanners using a VM on a Mac or PC. However, I highly recommend using a separate old computer running on the required OS. Both scanners are designed for 35mm film, loaded as either an entire film roll or strips of 3 or more frames. The Noritsu also accepts – now defunct – APS Cassettes. Both scanners produce high quality files, using the same Digital ICE technology to remove dust on film. Any other format available with Adobe Photoshop. Because these scanners were designed for high-volume usage, both are incredibly fast – much faster than any consumer product. The manufacturers’ scanning capacity specifications are listed below. A couple of nuances to note…On the Noritsu, using Digital ICE does not affect capacity, whereas it halves the capacity of the Kodak. The Kodak’s advantage comes from the saving process: its software enables automatic file-saving, whereas the Noritsu requires you to save files one at time using Adobe Photoshop. Based on a quick technical comparison, Noritsu comes out the winner. It provides unparalleled scan quality, producing high resolution scans that can be used for large prints, without compromise. If your goal is producing professional-quality scans and prints – or enjoy experimenting with different types and ratio of 35mm film – the Noritsu is for you. That said, the Kodak is popular for a reason: it’s compact and it’s fast. If you’re primarily scanning photos for online publication or small prints (8”x12”), this may be the better choice for you. One consideration: make sure willing and able to work in Windows XP! thanks for the concise summation here!